On this first night of the Colloquium, we would like to give everyone a warm welcome with a toast to break the ice. We shall be accompanied by the virtuous musicians of the Cuarteto Pagagnini (Eduardo Ortega, Gartxot Ortiz and Fernando Clemente, captainded by Ara Malikian). 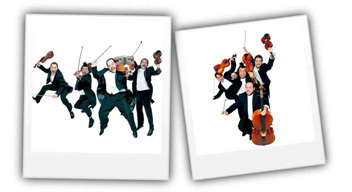 They form a wonderfully amusing and cutting-edge group, masters of the violin, cello, and stage performance arts. Pagagnini is a musical show full of humor and great gestural expression. The musicians and actors play and enact Mozart, Pachelbel, Chopin, Boccherini, Falla, Sarasate, and of course, Paganini, but also involve popular genres such as rock or folk. Their performance not only gives listeners a taste of classical music, it also possesses other virtues of more importance and depth. Only those who are exceptional are able to parody their own art. Long life to the musicians! This event will take place at the Galería de Cristal of the Palacio de Cibeles, which is in the city’s Ayuntamiento (City Hall), located in Madrid’s emblematic Plaza Cibeles. 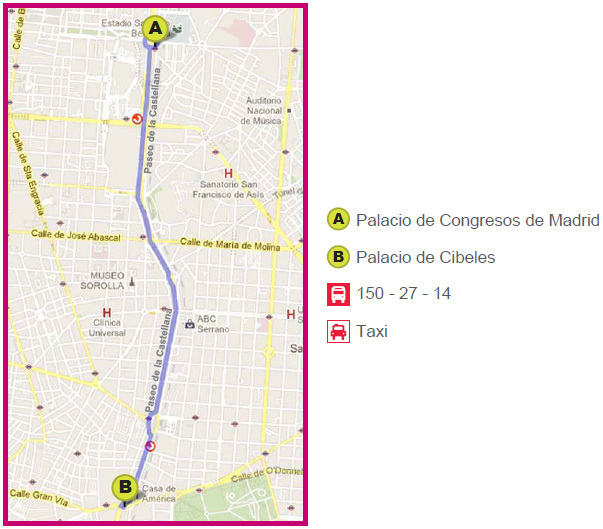 Bus: Walk 3 minutes from Palacio de Congresos to the bus stop located in Paseo de la Castellana 95. Once there, take bus number 150, 27 or 14. After about 20 minutes, get off at the Recoletos stop # 3 and walk 2 minutes to the Plaza Cibeles. Taxi: The trip takes a few minutes. The price will be quite low if you share the ride. Metro: Banco de España (L2). You may have to commute subway lines a coupleof times. Free access for Colloquium attendees (the identification card is mandatory) who have previously registered for this event. Accompanying person: access with the complete pass (see below) or with a ticket for the event, which can be purchased at the Colloquium Secretariat for 20€. Click here to see other social events or to register.